Costa Rica is an adventure, nature and beach lover's paradise that attracts visitors from all over the world. Visitors often have a hard time fitting everything in one trip as there is so much to do and see, yet so little time. For this reason, we have created a list of the most popular attractions that are at the top of most must see lists. Admittedly, creating a list of the top Costa Rica attractions is a little like choosing needle out of a hay stack. Well maybe that is a little exaggerative, but there are so many to choose from it is difficult to narrow such a sizeable list down to a score. Somehow we have managed to do just that and are happy to share this list with you. Click on the links below to read about our recommended top 10 Costa Rica attractions. 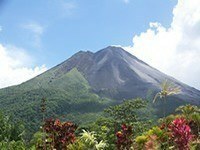 Arenal Volcano is the most popular attraction in Costa Rica. Though currently not erupting, the volcano remains fascinating and an incredible backdrop for the many adventures in the area. The hot springs are still flowing and many resorts at the base of the sleeping giant offer manicured tropical gardens with hot springs flowing through them for guests to enjoy after a long, hard day of adventuring. Click on the link to learn more about Arenal Volcano. The Childrens Eternal Rainforest is a protected cloud forest and rainforest located between Monteverde and Arenal National Park. This is an area of vast contrasts in elevation and tough terrain. The reserve is privately owned and was funded mostly by school children collecting pennies in milk containers back in the 1980s. Click on the link to learn more about the Childrens Eternal Rainforest. 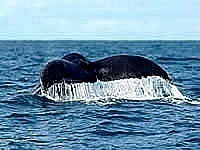 Costa Ballena literally translates to Whale Coast. The area referred to as Costa Ballena is located on the south Pacific coast between Dominical and Uvita. Much of this area is within the protection of Marino Ballena National Park, which is a marine park with the purpose of protecting dolphins, whales and other sea life. One of the most interesting creatures that can be found here are the Humpback Whales, which come down to rear their young annually. Click on the link to learn more about Costa Ballena. 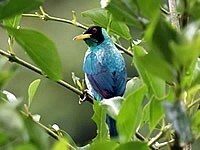 Gandoca Manzanillo Wildlife Refuge is located down at the southernmost point of the Caribbean coast of Costa Rica. This is one of the wildest places in the country with rainforest, coastal mangroves and almost inconceivably beaches with coral reefs. Within the mangroves many fish species spawn their young, there are manatees and many crocodiles. I the rainforest, there are hundreds of species of wildlife including several species of monkeys, sloths, toucans and many more. The coral reefs provide shelter for many fish species and marine life. Sea turtles have utilized the beaches for nesting for millions of years. The biodiversity of this little visited refuge is astounding! Click on the link to read more about Gandoca Manzanillo Wildlife Refuge. Manuel Antonio is an amazing destination with beautiful beaches, pristine forests in the national park and loads of wildlife. Visitors to this area are in for a treat as a drive through Manuel Antonio is almost like taking a drive through Jurassic Park! 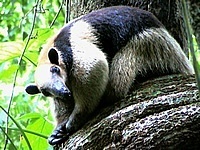 Keep your eyes peeled as you will likely see at least one of several species of monkeys, sloths, parrots or toucans. Then when you reach the end of the road, it opens up to one of the most beautiful tropical beaches imaginable. This truly is one of the most amazing destinations in Costa Rica that nobody should miss. 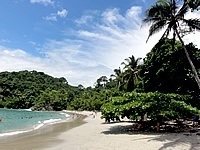 Click on the link to learn more about Manuel Antonio. There is a local legend that goes as follows; in the beginning of time on the day God painted the sky, he dipped his paint brush in a river to wash the paint off. The result was the creation of the incredibly beautiful Rio Celeste. The Kool Aid blue color of the water is simply gorgeous. When you reach the river via a trail in Tenorio National Park there is the spectacular Rio Celeste Waterfall which is surrounded by emerald green plant life. It truly is a sight to behold and one you will never forget. Click on the link to read more about Rio Celeste. Rincon de la Vieja is a volcano and national park located in the northwest corner of Costa Rica. This is one of seven active volcanoes in the country and has been more active recently with mini eruptions of steam and ashes. There are trails throughout Rincon de la Vieja National Park, making it a great destination for hikers. 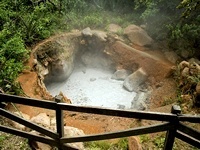 One of the largest attractions to the park is the 124 acre Las Pailas section, which has fumeroles, mud pots and natural steam vents. Click on the link to learn more about Rincon de la Vieja. The Tree of Life tour is located near the south Pacific in the towering Talamanca Mountains between San Isidro and Dominical. The tour is located on a private property owned by an intriguing family. 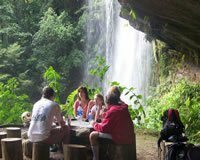 As they take you on the vigorous hike up the mountain you will learn about rainforest medicinal plants and possible spot wildlife. When you reach the top, it opens up to an astoundingly beautiful double waterfall which pours in front of a cave. The family has turned the cave into a jungle retreat with rough beds, fully functioning kitchen and bathrooms. Click on the link to learn more about what you can do at the Tree of Life. The Aviarios Sloth Sanctuary is a private facility located on the southern Caribbean coast, just north of Cahuita. The family has dedicated their home and land to the research, protection and rehabilitation of sloths in the area. Volunteers can come for one month stays and assist with the various projects or day visitors can pay a reasonable entrance fee which also includes a canoe ride through mangroves. 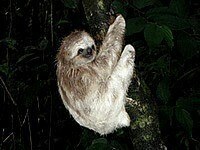 Click on the link to learn more about Aviarios Sloth Sanctuary.